I enjoyed Nowhere Boy from start to finish. I found it a provocative film in many ways. It made me think about other films and most of all about how to represent the Northern England of my youth. Something about the film was unsatisfactory, but I find it hard to say what. An obvious starting point might be a comparison with Control, a very similar film also scripted by Matt Greenhalgh. Control struck me instantly as a film of the year, despite its first time director and cast of relative unknowns (apart from Samantha Morton). I’m wondering if Sam Taylor-Wood, herself a first-time feature director, might have chosen the black and white route that Anton Corbijn took? Nowhere Boy is set 20 years earlier than Control and the difficulty in presenting historical views of the North West is perhaps even more evident. So, how do you represent suburban Liverpool in the late 1950s? The problem for a relatively low budget film is that finding the right locations and period props and costumes just isn’t enough to create the ‘period costume look’. What you end up with is something like a theme park. It looks ‘authentic’ but there are very few people about and it’s generally too clean and tidy to represent that 1950s world. There were one or two moments when I did think of the Terence Davies trilogy. Somehow, he managed to convey Liverpool of the period more effectively by stylising it. Taylor-Wood is an artist with video experience but possibly she hasn’t got the filmic vocabulary yet. Having said that, the production design of the interiors of the houses was terrific and very effective in distinguishing the lower middle-class home of Mimi and the more cluttered working-class home of Julia and Bobby. Nowhere Boy focuses on the early life of John Lennon. Matt Greenhalgh has clearly messed with the events and dates of Lennon’s childhood to create an effective story. Nothing wrong with that, but since aspects of the story are so well known (e.g. the birth dates of the individual Beatles) it does mean that there is a danger that audiences will be spending time questioning aspects of the narrative instead of focusing on the story events themselves. And it is quite a story. I wonder if it might not have been easier and more effective to create a completely fictitious story about another character who went through the same life experiences without having the constraints of a biopic structure forced onto the script? 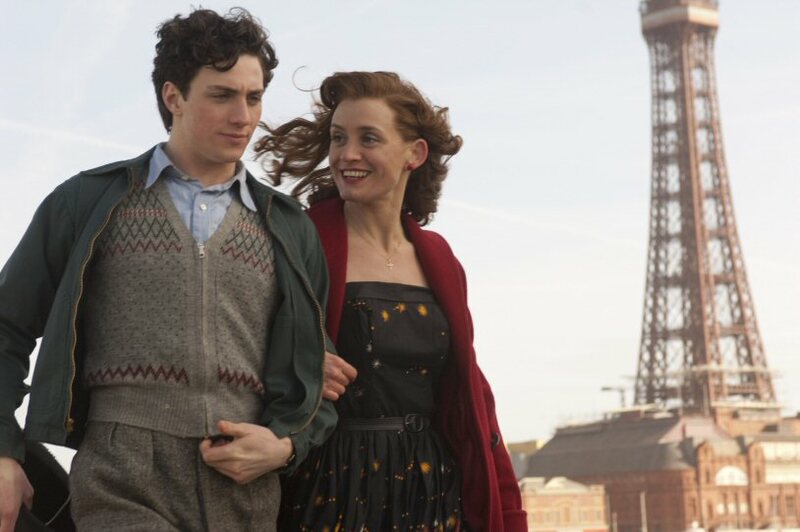 Like Control, Nowhere Boy relies to a large extent on the casting of its central character, played here by Aaron Johnson. Johnson is clearly a talented young actor and by the end of the film he had become a convincing John Lennon. The problem is that at the beginning of the film he didn’t work for me as a 16 year-old schoolboy. This isn’t a criticism of his acting as such – simply that he was too muscular and adult-looking (I hasten to add that I haven’t seen pictures of Lennon at 16 – only those of the Quarrymen when he was 17/18). Johnson was actually 18 during filming. 1950s fashions did tend to make some men look older, but Johnson just seems too healthy! As you can see, I’m struggling with concepts of realism and authenticity – but they are set up by the film. I think the problem is compounded because Johnson looks something like Lennon in terms of hair etc., whereas the actors playing McCartney and Harrison do not necessarily have that kind of instant recognition. For me, Anne-Marie Duffy steals the film as Julia Lennon (the banjo playing was the high point), but Kristin Scott-Thomas, David Morrissey and David Threlfall are also very good. The music is generally excellent. All round then a good effort, but it could have been great with a slightly different ‘look’. Andrew Higson once coined the a phrase that described the standard shot for the realist dramas of the British New Wave as something like: “the view of our house from the top of the hill”. After seeing Nowhere Boy, I’m wondering if there isn’t an equivalent shot from British movie biopics of the late 1950s. It’s the hero getting on his bike (with drop handlebars) and setting off for grammar school. It occurs at the start of That’ll Be The Day with David Essex and may well have been stolen from Saturday Night and Sunday Morning (with Albert Finney) by way of Truffaut in Les Mistons and Jules et Jim. This entry was posted in British Cinema, Films by women. Bookmark the permalink. I also felt slightly disappointed after seeing this although it was enjoyable enough while I was sitting in the cinema. At the risk of seeming obvious one difference with Control is that the latter could build up to a climatic moment – the suicide of Ian Curtis. That tension was always there for those who knew the story whereas at the end of Nowhere Boy the character was about to embark on one of the most successful careers ever in music. However, it did provide context to John Lennon’s anger and his reputation for being unpleasant and a bully. You’ve often said that biopics are “difficult” and perhaps this is another example. Yes, that could be one reason for the film’s slightly disappointing performance. Given the central character, the acting talent and the buzz around the director, the current box-office (£1.25 million after 7 weeks) is not that much better than Control‘s £1.13 million over the same period. I wish it was easy to get the audience profile figures for both films – my guess is that Nowhere Boy has attracted more of the general specialised cinema audience, whereas Control appealed more to a specific fanbase (and therefore younger). But I may be way off. I don’t know much about Sam Taylor-Wood, but I’m a bit surprised that an artist working on video pieces wasn’t more experimental in approaching the story of a young man with artistic pretensions himself. She includes a thanks to the late Anthony Minghella in the credits and she did work with him at one time. Minghella seems to have been a nice guy who was highly respected by colleagues – but I’ve never really gone for his films. I wonder how Nowhere Boy would have turned out if a North European artist turned filmmaker had directed it? Even better, imagine what Fassbinder might have made of the melodrama! btw the production notes reveal that the costume designer, Julian Day, also worked on Control. He makes some interesting points about the need for colourful designs and makes me think that possibly it’s not black and white that the film needs but some other stylistic feature, something noirish. There are moments in the film which just seem banal – the crane shot at the Summer Fete looks like a margarine commercial, but perhaps that’s just because I’ve seen the b+w images of the Quarrymen so many times. I’m sure that there is plenty more to say about this film. I can see that the performances have certain limitations in the film. However, I think another problem is that the film tends to melodrama. I think melodrama is great, but this film only uses in part. In particular, there is a conflict at the centre of the film between the ‘alternative mothers’, who also represent alternative class situations. But that is not explored in the context of the film, which I think would add to its sense of purpose. The ‘bicycle’ motif is interesting. Presumably Alan Bennett has spotted this, because it re-appears in The History Boys. I don’t know if the trail has gone completely cold on this thread but it didn’t get a cinema release up our way and I’ve just seen it on DVD. Really interesting stuff in the thread on genre and style but I’ll limit myself to casting which I thought was terrific. I had worries about Kristyn Scott-Thomas playing Aunt Mimi (no, not about her French accent this time!) It was indeed an interesting casting choice. I hadn’t thought of her as a provincial petite-bourgeoise but she catches it to perfection. (I should have recalled the remarks Lawrence Olivier is supposed to have said to Dustin Hoffman: “Try acting, dear boy”). And she and Anne Marie Duff worked extremely well together, especially in bringing out the class differences that had developed between the sisters. Like everyone else here I feel frustrated that UK films like these can’t seem to attract decent audiences. Anything we can learn from across La Manche?